Sir Thomas Osborne, 1st Duke of Leeds (d. 1712). By descent to George Godolphin Osborne, 10th Duke of Leeds (d. 1727), by whom sold, presumably in the early 20th century. Sir Harold Wernher, 3rd Bt. (1893-1973), Luton Hoo, Bedfordshire, in the Collection Wing, in the Lower Corridor, and by descent. 1949 Luton Hoo Inventory, in the First Floor Corridor. This imposing Queen Anne parade chair, with its high back and elegantly scrolled frame, is designed in the early-eighteenth-century Louis XIV 'antique' or Roman fashion. With its frame carved in light relief with ribbon-guilloches enriched with Roman acanthus flowers and husk-festoons, it relates to the French 'Grande chaise d'apartments' as featured in a contemporary pattern invented by Thomas Laine (d. 1739), architect and sculptor to King Louis XIV (see P. Fuhring 'Late Seventeenth and early Eighteenth-century French designs of Upholstered Furniture', Furniture History, 1989, pp. 42-44, fig. 7). Recalling Louis XIV's vase-decked tables illustrated in Pierre Le Pautre's 'Livres de Tables' of circa 1690, the chair frame is ornamented with a 'casolette' urn that is supported on serpentined stretchers tying the legs, whose domed and hermed pillars terminate in trussed feet with fretted or bifurcating volutes repeating the form of the serpentined arms. The chair's architecture relates very closely to that of state apartment furnishings commissioned in 1710 for Hatfield House, Hertfordshire by James Cecil, 5th Earl of Salisbury (d. 1728). The 'Salisbury' bed of richly laced damask and its accompanying chairs were described as 'richly carved and ornamented with mouldings very hansome', when supplied by the Westminster 'Gentleman Upholsterer' Thomas How (d. 1745) of Jermyn Street. He also referred to their voluted scrolls as 'mouldings broke with Sweaps' and to the chairs as having 'Cross stretchers richly carveid and gilt w gold'. (G. Beard and C. Gilbert, Dictionary of English Furniture Makers, London, 1986 p. 453, and G. Beard Upholsters and Interior Furnishing in England 1530-1840, London, 1997, pp. 141-2, fig. 131). This chair, which originally formed one of a pair at Luton Hoo, relates closely to seat furniture that has been tied to payments made in 1702 by Thomas Osborne, Ist Duke of Leeds to the court 'Upholder' Philip Guibert (d. 1739) (spelt as 'Mr. Hibbert' in the Duke's accounts). The Duke of Leeds built a magnificent palace at Kiveton, Yorkshire 1699-1705, and it is probable that the rich furnishings supplied by Guibert were destined for that residence. Guibert was noted as trading in 'St. German's (Jermyn) Street' when admitted into the Freedom of the Worshipful Company of Upholders in 1702, so was located near to Thomas How (see G. Beard op. cit., p. 117, and C. Gilbert, Furniture at Temple Newsam and Lotherton Hall, Leeds, 1978, vol. I, pp. 264-8, cat. 322-3). The Wernher armchair matches a settee and six armchairs which passed by descent to the Rt. Hon The Earl Cadogan, M.C., and were sold anonymously in these Rooms, 16 February 1956, lot 98. 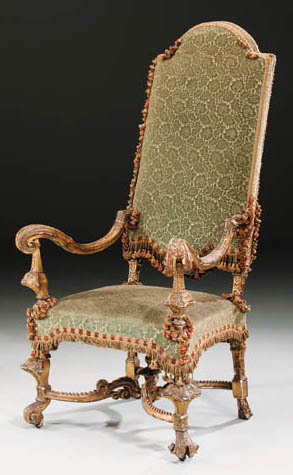 Another armchair of the same model, almost certainly from the same suite, was sold, Sotheby's, London, 17 November 1989, lot 31, and again 22 April 1994, lot 41 (49,900).